Spreading awareness using branding can help expand supporters of a very important cause. 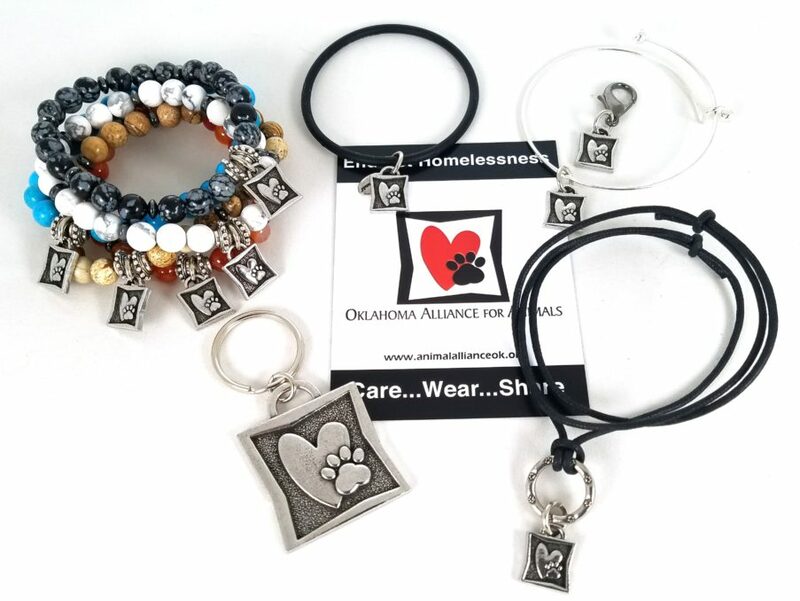 OAA first reached out to Charity Charms back in 2015 to create a custom logo charm used on keychains and GivingBands. Those items were very successful, so during the holiday season, they wanted to expand their line of offerings to give as gifts and for fundraising. Ultimately, we used their adorable logo charm to create an expansive branded line and custom, matching carding. In addition to the classic keyrings and GivingBands, we launched Bangles, CharmaPower Stone Bracelets, an adjustable Cord Neck, and Dog Collar Charms. In fact, our dog collar charms are a brand new product that has been a huge hit with other animal loving charities like Best Friends Animal Society and Canine Companions for Independence. 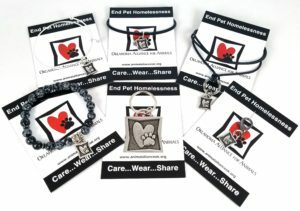 They are lovable little charms that simply clip onto your dog’s collar (or your purse/backpack) letting the world know you and your pet support pets in need. Like OAA, once a charity creates a charm, they often move forward with fun, new items to re-engage their supporters. In other words, an organization utilizing a full line has more options for spreading awareness using branding. Pet homelessness is a serious problem. Just imagine not having your furry little friend around to shower you with love. According to estimates, 79% of households in the United States have at least one pet. But it is important to remember every day millions of pets live with uncertainty in their lives. Pets often end up homeless due to housing issues and overpopulation. In fact, 6.5 million pets end up in shelters each year. The Oklahoma Alliance for Animals works to ensure every pet finds a forever home. Established in Tulsa in 2004, the alliance works to fight homelessness, abuse, and neglect. Their mission is to reduce overpopulation by teaching responsible pet ownership. They do this with education about key resources. For example, access to affordable services and pet pantries for needy families. According to the ASPCA, 1.5 million animals are put to sleep each year, but because of an increase in adoption, this number is steadily declining. In general, each year shelters and rescues across the country see 3.2 million adoptions. The Alliance has a lot of programs to improve communities. For example, Gimme Shelter addresses problems in shelters. The solutions increase efficiency and cut costs. Small changes mean the difference between suffering and comfort for animals up for adoption. There is a future where healthy animals are not put to sleep for being homeless. With this in mind, OAA wants to increase adoption from shelters and rescues, and this means reducing the number of animals who enter them. With this in mind, the alliance works hard to reduce acts of animal cruelty. By educating the public about abuse and neglect they show the community how to care for the animals they love. Not surprisingly, twice as many stray animals enter shelters, therefore, the Oklahoma Alliance for Animals mission is very important. In essence, as an animal lover, you definitely know how animals fill our lives with unconditional love. It’s important to help these little, lovable beings who can’t always help themselves. The team at Charity Charms loves their pets. We think everyone should have a lovable furry friend by their side. Helping the Oklahoma Alliance for Animals is easy. Reach out and donate, volunteer, or check out their online wishlist. Bring awareness to your organization, school or business through the Power of Charity Charms!